The Geometric style appeared from 900 BC and favoured the rectangular space on the main body of the vase between the handles. Bold linear designs (perhaps influenced by contemporary basketwork and weaving styles) appeared in this space with vertical line decoration on either side. 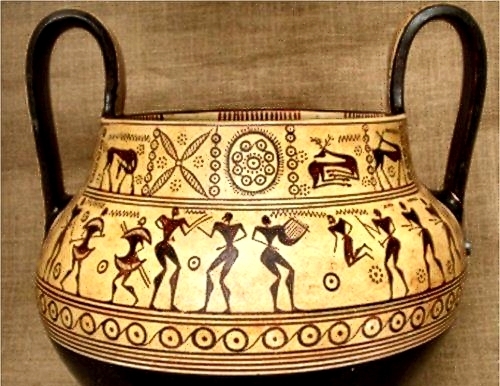 It was in this period that the Meander design first appeared (perhaps inspired by the practice of wrapping leaves around the rims of metal bowls), destined to become forever associated with Greece. 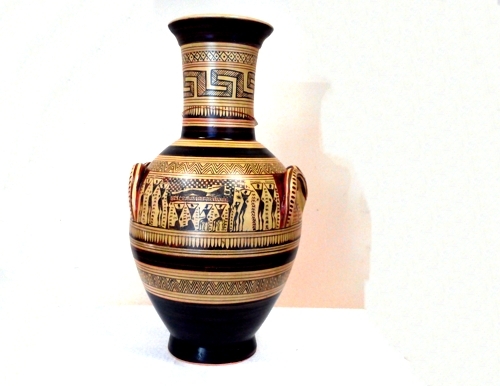 The lower portion of Geometric vessels were often painted in black and separated from the rest of the vase using horizontal lines. 8th century B.C. Copenhagen, Denmark. The Geometric style was characterized by deep symbolism. Bodies and limbs were represented by triangles. Thousand of brush strokes were applied to cover the entire surface of the vase with figures, rosettes, meanders, cross hatching and spirals. The design was arranged in horizontal bands. 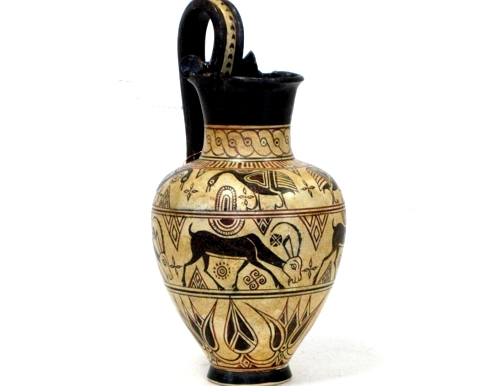 Paintings on the natural ceramic colour with a lustrous brown glaze, as had been the case with the Minoan vases, created the decoration. 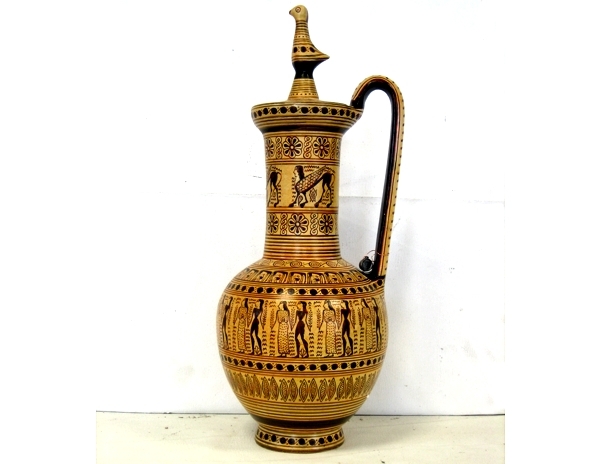 Statuettes of birds or horses or miniature vases were often used for handles to the lids. About 8th century B.C National Archaelogical Museum, Athens. Towards the end of the period, in the 7th century BCE, the so-called Orientalizing style became popular in Corinth. With its eastern trade connections, the city appropriated the stylised plants (e.g. lotus, palm, and the tree of life), animal friezes (e.g. lions), and curved lines of Egyptian and Assyrian pottery to produce its own unique Greek version.